For more information about this event, please contact Fairmont Le Reine Elizabeth at celebrationsQEH@fairmont.com. 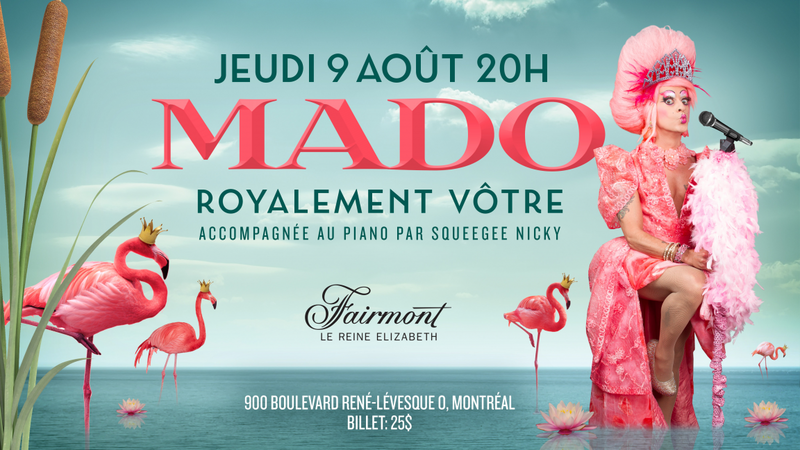 August 9, 2018 marks the beginning of the annual Pride Montreal festivities, and Mado, the Queen of the Montreal night, has big plans for the first night of the week! Fairmont The Queen Elizabeth presents: Royalement Vôtre! Attend an exclusive performance by the Montreal gay community's leading diva during a colourful evening at the Queen E. A portion of the proceeds from ticket sales will be donated to Pride Montreal. Mado Lamotte has been performing for over thirty years, making a name thanks to her excentric style and cabaret named after her. This will be his first appearance at the Fairmont Queen Elizabeth. She will be joined by Squeegee Nicky on the piano. After the show, we'll be expecting you on the Nacarat Terrace! This event is for guests 18 and older.